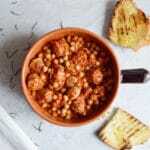 Spicy chickpeas and herby sausages with garlic, rosemary, fennel seeds and a little kick. Easy and comforting. Add the tinned plum tomatoes to a large pot under a medium heat. Fill each tin half way with water and add to the pot to get every last drop of tomato from the tins. Brake the plum tomatoes up slightly with a wooden spoon. Add a splash of chickpea juice from one can to the pot then drain both tins and add the chickpeas to the tomatoes. Add the spices and stir. Cut the sausages into large chunks ( cut each sausage into 2 or 3 ) then add to the tomatoes and chick peas. Add the Rosemary, garlic and a little salt and pepper and simmer for 45 minutes to an hour until the sauce has reduced and sausages cooked through. Check seasoning at the end and add to taste. Heat a griddle pan on a high heat, drizzle a little olive oil, salt and pepper on the crusty bread slices and griddle on each side until toasted. Spoon the chickpeas and sausages in warm bowls and dollop on some sour cream, serve withdrew griddles crusty bread & enjoy! I love to find the soft garlic cloves and squash them onto a piece of crusty bread topped with the chickpeas and sausages, it's absolutely delicious!